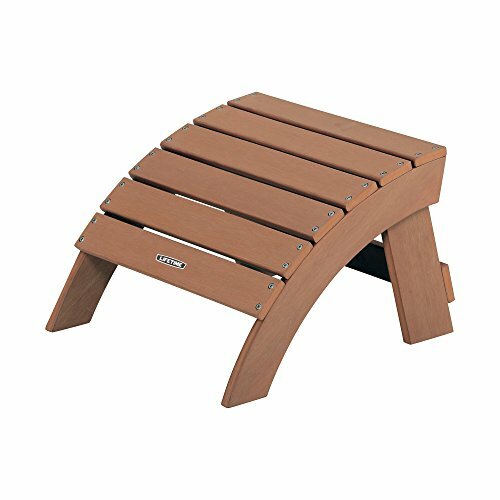 Constructed of UV-protected polystyrene simulated wood, this ottoman has been designed to compliment the lifetime Adirondack chair (60064). comes with a 2-year limited warranty. Made to compliment lifetime Adirondack chairs, the Adirondack ottoman is constructed of UV-protected, weather-resistant polystyrene. Unlike wooden furniture, the simulated wood will not splinter, warp, or rot & never needs to be painted or varnished. So put your feet up & enjoy a relaxing afternoon with family & friends. The Adirondack ottoman from Lifetime Products is the perfect addition to your patio set.